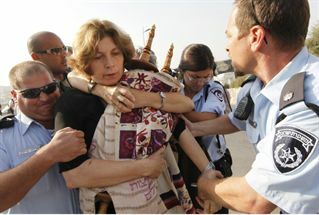 The heart-rending picture of Anat Hoffman clasping a Torah Scroll is just part of a pantomime. She does not accept that what is written in it is at all binding on her. To her, it is not an object of holiness – just an artifact to use for publicity. The writer is an international educator, teaching and training teachers around the world. His real name is known to the editors. For the past 26 years, on the first day of the new Hebrew month, Rosh Chodesh, Anat Hoffman has been leading a group of women to pray at the Kotel, the Western Wall. Sometimes she comes enrobed in prayer shawl and phylacteries (tallit and tefillin, ed. ), sometimes with a Torah Scroll so that she can chant the Torah reading for herself and other members of the group. These women have become known as “The Women of the Wall” – “WoW”. These meetings have met with fierce opposition from other women who pray regularly at the Kotel, from religious men, from the authorities entrusted with the management of the Wall and from various sectors of society. Overtly, Anat Hoffman is a sincere person who, with others, wants to assert her right to pray at the Wall the way she feels is appropriate. As such, her group has aroused much sympathy from the media and from groups in Western countries. The antagonism from the local rabbinate is interpreted as being undemocratic and as stifling the valid feelings of the women and preventing them from being able to serve Hashem in the way they wish. Their supporters quote various authorities who permit women to wear tallit and tefillin. However, in an interview with the BBC, Anat Hoffman, leader of te Women of the Wall, revealed her true identity and purpose, so now we can analyze her motives more accurately. First, a personal note. Since members of the Reform have, by halakhic standards, abandoned their lineage, Anat Hoffman might, by those standards, be open to questions about the validity of her being Jewish at all. Now, what are the principles of the Reform Movement? The Reform Movement requires some sort of belief in a Deity, but the rest is ‘take-it-or-leave-it’. Over the years, attitudes have changed and are still changing. Reform Movement leader W. Gunther Plaut writes "There is no such thing as a Jewish theological principle, policy, or doctrine." This is because Reform Judaism affirms "The fundamental principle of Liberalism: that the individual will approach this body of mitzvot (commandments, ed.) and minhagim (custom, ed.) in the spirit of freedom and choice”. Even those in the traditionalist wing of Reform Judaism accept that the primary principle of classical Reform is personal choice. Personal choice has precedence over Jewish tradition. The painful fact is that in some ways, Christianity is more ‘Jewish’ than the Reform Movement. The Reform Movement only insists on belief of the one Deity and everything else is ‘as you want and feel’. So, Reform could, in theory, accept Protestant Christians and Moslems as being within their fold, but might reject Roman Catholicism because their deity is composite. This means that the Reform Movement should regard halakhic Judaism as acceptable, even though Orthodox Judaism does not tolerate the Reform Movement, and should therefore respect the right of halakha-keeping Jews to worship as they wish. If Ms. Hoffman were to behave as a true Reform Jew should, she would respect the wishes of the Orthodox and seek to ‘do her own thing’ without infringing on the feelings of the other worshipers at the Wall. If her intentions were pure, she would welcome any sort of compromise. However, she refuses to do that and on the contrary, is behaving in such a way as to be as provocative and offensive as possible in order to pursue her political agenda. Such behavior goes against the most basic principles of the Reform Movement and should draw the ire of its leaders, who should be protesting her actions. However, it is well known that those who profess total tolerance are most intolerant of those who oppose them. So Ms. Hoffman will not tolerate the Kotel traditions of the Orthodox. In her interview with the BBC, she admitted that her efforts to gain recognition at the Kotel are only to enable the Reform Movement to undermine the authority of the halakhah-true Rabbinate and gain recognition for Reform ‘Rabbis’, conversions, weddings and divorces. Hence the heart-rending picture of Anat clasping a Torah Scroll is just part of a pantomime. She does not accept that what is written in it is at all binding on her. To her, it is not an object of holiness – just an artifact to use for publicity. Similarly the tefillin she wears is also part of her pantomime costume, as the details of the construction of tefillin are revealed to us only through the Oral Law and the Sages, whom she despises and for whom she has no respect. She quotes various authorities which permit women to wear tallit and tefillin, but she herself neither respects those authorities nor regards them as being binding on her for anything else. She chooses the first day of the new month, Rosh Chodesh, for her ‘service’ because in Jewish tradition, on that day women have a special status. At the time of the sin of the Golden Calf, they remained faithful to G-d and his servant Moshe and resisted the temptation to worship the idol. Is she remaining faithful to Moshe and the Torah he passed on to us from G-d? Is she continuing the tradition of those brave women in her daily life? Of course,not. In fact, she is denigrating the Torah and fighting a war against its authority and sanctity. So why is she choosing that day? Because she is using it to ensnare women to follow her Pied-Piper tune. She looks forward to reading the Megillah because the heroine is a woman – Esther – even though Esther was totally and traditionally observant and submitted to the authority of a male rabbi – Mordecai. But that does not worry Anat because the idea appeals to women, so she includes it in her pantomime. Why does she stage her pantomime at the Kotel? Is the Reform Movement in favor of sacrifices and all that the Holy Temple represents? Of course not. For example, Isaac Mayer Wise together with Reform Rabbis Kalisch and Rothenheim, re-wrote the Reform prayer book so that, "The piutim (liturgical poems, ed.) were discarded; everything [that might be seen as] kabbalistic and everything dealing with the sacrificial cult, the messiah, the return to Palestine" ….. were simply eliminated and were replaced by modern concepts.". The Reform Movement regards the activities of the Holy Temple as heathen-like, primitive and unbefitting the modern world. Their attitude is that almost everything connected with Jewish ritual law and custom was of the ancient past, and thus is no longer appropriate for Jews to follow in the modern era. For Anat, a member of that movement, the Kotel is no more than a great backdrop for her monthly show. She claims that the hareidi Jews are only a small part of the population of Israel and that she represents the majority of the population. She uses the word ‘hareidim’ to suggest that only people living in Mea Shearim and Ramot Beit Shemesh Bet are faithful to the Torah and the authority of the rabbis. Affairs MInistry released that 51% of all children who entered Kindergarten this year are enrolled in hareidi/national relgious classes. Three whole cities are entirely hareidi, most of the towns of Judea and Samaria are national religious, and every other city in Israel has a large percentage of hareidi/religious Zionsit citizens. Most of the inhabitants of Jerusalem are hareidi or religious Zionist. For example, Ra'anana has 52 congregations, of which only 1 is Reform. In all of Israel, there are only 26 Reform and Conservative congregations, compared to thousands of hareidi/national religious congregations. 38 MK’s are halakhically observant out of 120 and only a few are dedicatedly irreligious. But very few people realize the depth of Anat’s deception. I am sure that there are many ‘Women of the Wall’ who are faithful to the Torah and halakha and respect the Torah-true rabbis , but feel they are enhancing their connection with Hashem by joining Anat and taking part in her activities. They should know that her activities are no more than a smokescreen aimed at undermining the role of the Torah and the halakhic sages. I therefore appeal to those women to divorce themselves from Anat and her deceitful political agenda and to consult with their religious authorities to determine whether or not what they do at the Wall is truly a service for Hashem and his people.